As simple as ABC but you have to See! 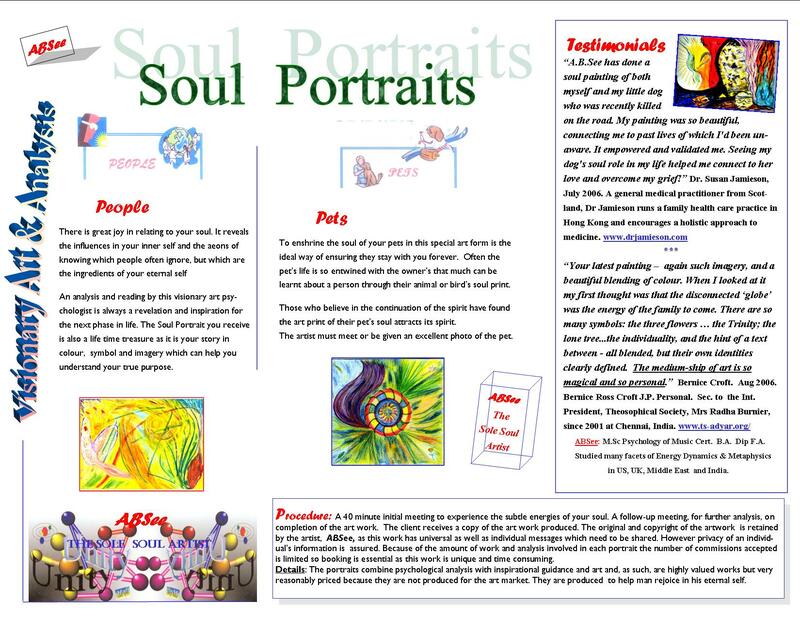 A soul portrait identifies the influences that are calling you in this lifetime. It provides you with an understanding of your inner nature and gives you directions for achieving your soul's purpose in this lifetime. Your SOUL is a precious reservoir of your eternal journey. Many, particularly in secular societies and Western countries, spend little time studying it, listening to it, or caring for it because they have either denied it or misunderstood its resplendent nature and integral part of our BEING. of one's soul, and not to be entirely guided by it in one's life. The soul contains our immortal path and those who recognise that can benefit enormously from seeing its present level of connections with past and future lives and the many soul connections it continues to encounter. In many Asian communities a new baby is greeted with - "Oh what precious soul has returned to be with us now?" And sometimes someone will detect the new baby is a mighty soul that has rejoined for some great purpose. The Tibetan Bhuddhists, as is well known, find their reincarnated great lamas in this way. The famous American seer of the early 1900's, Edgar Cayce, found historical proof for reincarnation and along with many others has written much about soul groups reincarnating at the same time through many lifetimes. The members frequently stay in the same family groupings and reunite with former relatives and connections to complete unfinished relationships and in this way enable all to evolve. A.B.See uses a right brain approach to bring this information through. She is a gifted intuitive who has verified her work in many ways including bringing information through from ancient civilisations that has later been acknowledged. Portraits undertaken on an individual commission basis only. There is great joy in relating to your soul. It reveals the influences of your inner self and the aeons of knowing which people often ignore in this lifetime. Awaken to that and begin to explore your greater powers. Both a visionary artist and psychologist A.B.See combines right and left brain approaches to assist you in depicting your eternal journey. The art is always a revelation and insiration for the next phase of your life. It is also a lifetime treasure as it is your story in colour, symbol and imagery. Besides an artwork you receive an analysis of its import from higher consciousness. Enshrining the soul of your pet in this special art form is the ideal way to ensure they stay with you forever. Often the pet's life is so entwined with its owner that much can be learnt about the owner from the animal or bird's soul portrait. The soul portrait often also attracts the spirit and light of a greatly loved deceased pet. For full details access the brochure above by downloading the file below.